Whatever machine you ride, its suspension has been designed to perform the same function – and that is to try to eliminate the shock transmitted through the front and rear wheels as they traverse uneven road surfaces. By absorbing the shock from the road surface, a motorcycle suspension system reduces the stresses and strains that would otherwise be felt by the rider, and also by the majority of the motorcycle. Suspension was originally developed early in the 20th century in order to improve rider comfort. However, as machines became more powerful, highly advanced suspension systems have been developed to enhance handling performance, which for many years had lagged behind engine development. Motorcycle suspension design has come an awfully long way in recent years, largely due to the technology transfer from the racing world, which sees machines and riders subjected to the most extreme conditions. As a result, today’s road and off road riders benefit from highly sophisticated front and rear suspension systems which offer remarkable levels of comfort together with precision roadholding. 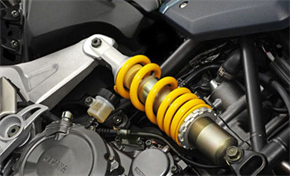 Here we will look at three of the main factors that influence the characteristics of every motorcycle suspension system: springs; dampers; and sprung/unsprung mass. 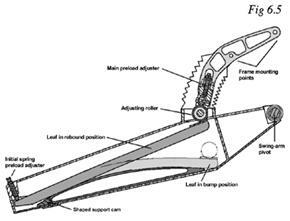 This feature is an introductory guide to how each one of these factors plays a role in the operation of your bike’s suspension systems. 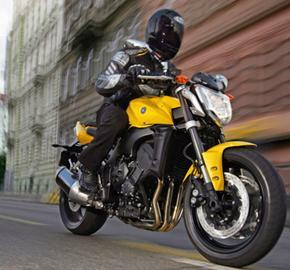 The innovative side-mounted shock absorber on the 2006 Yamaha MT-03 with its coil spring. The coils to the left feature a much wider pitch than those on the right, giving the spring a progressive rate. Every spring has a rate – more commonly known as its stiffness – which is a measure of the force required to compress it by a given amount. 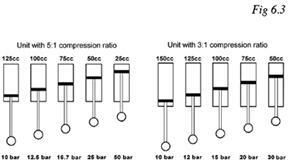 Spring rate is usually measured in N/mm, and so a spring with a rate of 10 N/mm will require an additional force of 100N to compress it by 10mm. (See Fig. 6.1) Not to be confused with rate is load, which is defined as the total force supported by the spring. 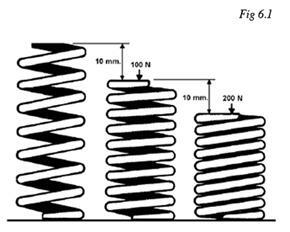 Some springs may be designed in such a way that their rate is constant, regardless of how much the spring has been compressed, and this type of spring is categorised as being linear. 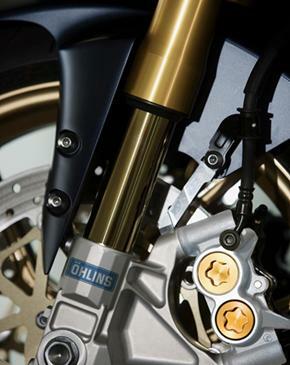 However, many springs used in motorcycle suspension systems are designed to give an increased rate as they are compressed further, and these are known as progressive. The two most popular springing systems which most riders will be familiar with are coil springs and gas springs. And we’ll also take a look at leaf springs, which could well become more commonly used in the future. The most common type of spring used in motorcycle suspension systems is the steel coil spring, which is featured on the vast majority of front forks and rear shock absorbers. As its name implies, it is formed by winding steel rods into a coil. When these coils are evenly wound into a constant pitch, the spring has a linear rate – which means that the rate will be the same throughout the whole suspension stroke. Gas springing has the advantage of being relatively simple, effective and naturally progressive. The best way to demonstrate the principles of using gas as a spring is to put your finger on the air outlet of an extended bicycle pump, and then push the main pump shaft with your other hand. The initial part of the stroke meets little resistance, but as the pump is compressed further the force required to push the pump handle increases rapidly. You will also notice how warm the compressed gas becomes! Although most riders are familiar with coil springs and gas shocks, few – if any – will have ever experienced leaf springs, which have only been used on experimental Yamaha factory machinery. In the 1990s Yamaha constructed a special YZ motocrosser equipped with a leaf spring system located beneath the engine. The machine was raced in Japanese motocross events to evaluate its characteristics, and lessons learnt could well be used in future suspension systems. The use of springs without a damper would be of no use to you or your machine. Every time you rode over a bump, the machine’s suspension springs would compress, and would then immediately bounce back, giving your machine the handling qualities of a pogo stick! The damper mechanisms on a motorcycle are designed to smoothly absorb the energy transmitted from a bump in the road into the suspension system. By dissipating this force, the damper system protects the rider’s body from the shocks caused by uneven road surfaces, and it also reduces the stress and fatigue that would otherwise damage the ‘sprung’ part of the motorcycle. The most basic damper design is the hydraulic system which, in its simplest form, consists of a rod attached to a piston which moves up and down in a cylinder filled with oil. Holes or valves in the piston allow oil to flow from one side of the piston to the other, and this process absorbs the road shock by converting the kinetic energy of the moving piston into heat, which is dissipated into the surrounding air. Of course, the processes involved in modern damping mechanisms are extremely complex, and this feature is not designed to cover areas such as low and high speed damping, flow control valves, shim stacks and so on. These, and other associated topics, will be covered in more detail in subsequent features of the Yamaha Motorcycle Workshop. Yamaha’s new 2006 limited edition YZF-R1 SP is equipped with sophisticated Öhlins front forks and lightweight forged aluminium Marchesini wheels that ensure low unsprung mass. The sprung mass of a motorcycle is that part of the machine which sits on top of the suspension, or in other words, the part of the bike which moves up and down if you sit on it and bounce on the seat. It follows that the unsprung mass is everything that does not move up and down! In effect, the unsprung mass of every bike consists of tyres, wheels, brake discs and calipers, rear sprocket, lower part of the front forks, and the swingarm. To be strictly accurate, a fraction of the suspension spring mass is also classified as being unsprung, but in reality this makes up a tiny proportion of the unsprung mass total. It is generally recognised that roadholding characteristics are enhanced by reducing a machine’s unsprung mass. For example, when a wheel goes over a bump in the road, a lower unsprung mass will allow the suspension system to respond to the shock more quickly and effectively, meaning that the tyre is more able to stay in contact with the road surface. This is why racing machinery and high performance supersport bikes feature exceptionally light, hollow-spoke cast alloy wheels, compact calipers and lightweight suspension components. In addition, the sidewall stiffness of the low profile tyres used on racing and supersport machines prevents the tyre from deforming on bumps, and transmits the road shock directly through to the suspension system. However, although the lower unsprung mass and quick suspension response of many high performance bikes will undoubtedly enhance roadholding, it may sometimes be at the expense of rider comfort. This is because the short, sharp vertical acceleration experienced by the rider’s body in this situation can lead to some discomfort. As always, you can’t get something for nothing! In contrast, if you look at a typical cruiser, it will usually be equipped with much larger wheels fitted with high profile tyres, and there will be much less emphasis on achieving low unsprung weight. This combination of a higher unsprung weight and fatter, high profile tyres will result in less aggressive vertical acceleration being experienced by the rider’s body as the machine passes over bumps, giving a more luxurious ride. High specification front and rear suspension systems on the 2006 Yamaha FZ1 offer a wide range of adjustability to suit different riding conditions. And like Valentino Rossi's factory YZR-M1 race bike, the front forks on the new FZ1 feature the compression damping valves in the left leg, with rebound damping valves in the other right fork leg. Consisting of springs, dampers and sprung/unsprung masses, the basic make-up of a typical motorcycle suspension system is relatively straightforward. However, the interaction between these component parts is actually very complex, and you only have to see how much time a racing team devotes to suspension ‘tuning’ to understand just how much effort is put into achieving the ideal set-up. As we have outlined, there is really no such thing as the ‘perfect’ suspension set up for day to day street use, because road and traffic conditions vary so much that some amount of compromise is inevitable. In addition, what may be regarded as the ideal set-up by one rider may be regarded as too stiff or too soft by another rider, depending on the type of riding they do, the roads they use, the speed they ride at, and their body weight. For this reason many Yamaha motorcycles offer a wide range of possible suspension settings, allowing riders to adjust rebound and compression damping, as well as spring preload, depending upon the model. It is usually a relatively simple process which is covered in the owner’s manual, or alternatively you can discuss your requirements with your local authorised Yamaha dealer.